I may be a little of a ginger ale snob since I got hooked on Reed’s but I thought I would give Blue Sky a try seeing how I like some of their other sodas. And I’m sorry I did. 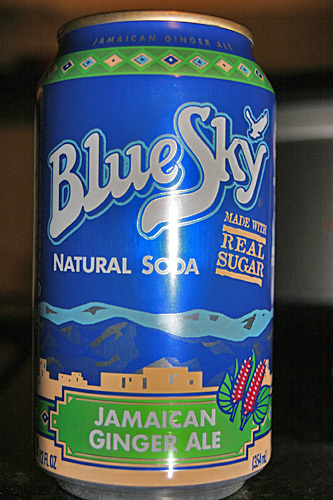 Blue Sky Natural Soda Jamaican Ginger Ale is so freakin’ sugary tasting that you can hardly enjoy the ginger part. It’s not that added so much more sugar to this soda but the proportions are waaaaayy off. The ingredients are: Filtered Carbonated H2O, Real Sugar, Natural Ginger Flavor, Citric Acid and Carmel Color. The ingredients for Reed’s are: Sparkling filtered H2O, pineapple juice from concentrate and honey, fructose, fresh ginger root (17 grams to be exact), lime and lemon juice from concentrate and spices. Now which one, just by reading, sounds better? Reed’s by a landslide! Just by looking at the difference in ingredients with the actual ginger root part, or lack there of in Blue Sky’s I should have known. Oh well, I just had to try. I’m sorry Reed’s, I won’t stray again! While I do think some of Blue Sky’s Natural and Organic sodas are delicious this one is most certainly not. To read more about Blue Sky and their soda products click here. To read more about Reed’s and their most amazing Ginger Ale products, click here.